Saturday I persuaded a friend, P, to join me in a trip to Kenilworth Road to witness Cheltenham Town’s FA Cup 2nd Round tie with Blue Sq Premier’s Luton Town. 6th in the conference and battling to get back into the football league, Brabin’s side had recorded only two home wins out of 6 in the league going into this match. Fans I’d spoken to prior to the game were convinced that Cheltenham would have an easy win. For the away supporters nestled in the Oak Road stand things weren’t quite that straight forward. P and I made our way to our seats complete with coffee and water, settling for seats just behind the goal, about 6 rows or so back. Several guys sat behind me and one asked me if I was any good at blocking the ball so he could decide whether to move. I pointed out my unfortunate record at getting hit by the ball at a variety of grounds and I said that if it headed my way, I would duck. The atmosphere in the away end was one full of anticipation. With 7 away wins, Cheltenham were in strong form, but we were taking nothing for granted. Cheltenham went ahead thanks to Duffy after just 2 minutes and looked strong in the opening part of the first half. But Luton were not going to just roll over. The team pulled themselves together and fought hard to make life as difficult as possible for the visitors. By 30 minutes in, I was on the edge of my seat, frustratingly watch Cheltenham lose possession and Luton press forward. Our defence was our saviour, keeping our lead safe until 40 minutes when O’Conner scored for the home side. To be fair to the Hatters, they had been pushing for that goal and deserved to get something for their work. Luckily, just before the half time whistle blew, Pack gave us back the lead and had the entire Oak Road stand on its feet. The guys behind me in the stand agreed that Luton were looking dangerous and we needed to pull it out of the bag in the second half. If we could start the second half as strongly as we did the first, we should be ok.
During the break, it started to get cold. Hat and gloves were put on and coat zipped up. The gloves were a mistake though as I was on Twitter duty for St Neots Town FC and can’t operate my phone in gloves. I’d hoped that St Neots would win by one or two goals but after the 5th had gone in, I gave up on the gloves (they finished 6-0 winners against Marlow). Talk about keeping me busy! Back in Luton, we witnessed O’Conner get his second and pull the home side back to 2-2 just 6 minutes into the second half. The home fans were thrilled. The away fans were silenced. But not for long. Soon, we found our voices as we watched Cheltenham push forward to the goalmouth in front of us. On 64 minutes, Summerfield gave us even more of a reason to cheer, putting us back in the lead. Luton started to press again and as we watched the action in the distance the referee produced a yellow card for a Cheltenham player. We couldn’t make out who it was. Luton’s free kick just outside the area was taken and again the referee blew his whistle, producing another yellow card quickly followed by a red. It was Duffy. All around me were murmurs and questions. We were unsure what had happened, a few thinking that he hadn’t been booked a first time. As Duffy walked slowly off the pitch and headed to the tunnel, the home fans started jeering. I saw him with his head bowed down and his arms locked straight held just in front of his body, fingers pointed down. I had no idea why and put this image to the back of my mind until the photos came out from the day. Duffy was walking toward the tunnel, just in front of the home fans. Signalling, 3-2. It was a tense last 10 minutes in the knowledge that Luton could press and we had just 10 men. Yes Luton looked dangerous and when the board went up to announce 5 minutes of extra time we couldn’t believe it. But Cheltenham turned the pressure up and in the 3rd minute of added time, Penn slotted the ball into the right hand corner and we were elated. When the final whistle went, my now fairly none-existent voice, found a little bit extra to cheer and sing for the team. As we left the ground, I asked P for his thoughts on his first ever experience of watching Cheltenham. He’d enjoyed the game and was all for seeing them play again. ‘How about the next round?’ I joked, ‘Depending who we get obviously’. P is a Stevenage and Spurs fan. The funniest thing I thought would be if we were to be drawn against Stevenage. The lads I watch football with are all Spurs/Stevenage fans and I’ve spent a number of years in the away stand at Stevenage, on my own, while they were in the home end. What I never expected was for Cheltenham to get an away draw at Spurs. A massive bonus for the club, players, staff and fans alike. I challenge anyone who supports/works for the club to tell me they’re not on cloud 9 over this draw! As for P? He’s said he’ll come along to the game if he’s free. But he wont be able to support Cheltenham. Yet another match where we meet in the pub and then go to our separate stands then! What a great way to kick off 2012. Bring on the Spurs. 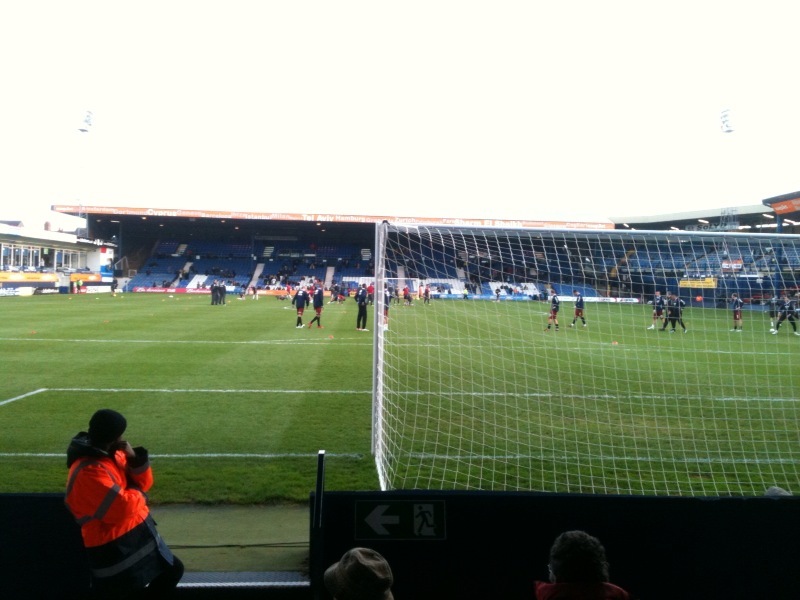 Posted on 05/12/2011 05/12/2011 by Jemma PhillipsPosted in Football, GloucestershireTagged Cheltenham, cheltenham town, FA Cup, Football, Gloucestershire, Luton, Luton Town, sport.